Have you ever rolled out of bed and decided that it was going to be a Donkey Kong kind of day? But then you just didn't have the means to make it happen? Don't let that scenario happen to you ever again! This extraordinary Donkey Kong kit will transform you into the Nintendo character with total ease. 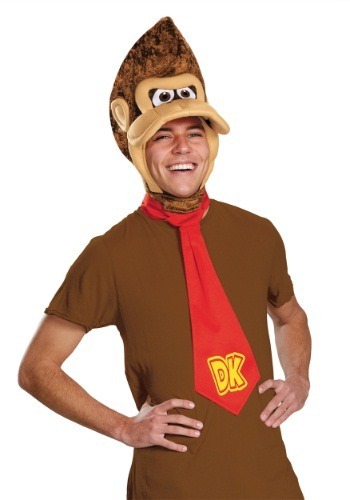 You can pair the funky hat and tie with a brown shirt for the easiest of easy costume looks. But our advice? Just keep the set on your bedstand every night, ready to go. Because you just never know when a Donkey Kong day is going to strike! Then if it's shaping up to be sunny with a forecast of DK, you'll be able to slap on this kit on and get your Kong on. The poly foam hat will give you an epic ape face to wear on your head. (And it will make you a little taller too!) Just secure the signature red DK tie around your neck, and you'll be ready to go. When you have this kit at the ready, the only thing you're going to have to worry about it having plenty of barrels to roll and making sure your racer kart always has a full tank of gas. Unless, of course, you run it on bio-banana diesel! Standard Headpiece Neck Circumference Up to 19" Up to 19"
Standard Tie Neck Circumference Up to 17" Up to 17"